Three days ago, 10 thousand people, a majority of them tribal, formed a 17 km long human chain around the Niyamgrii mountains in Orissa, India. 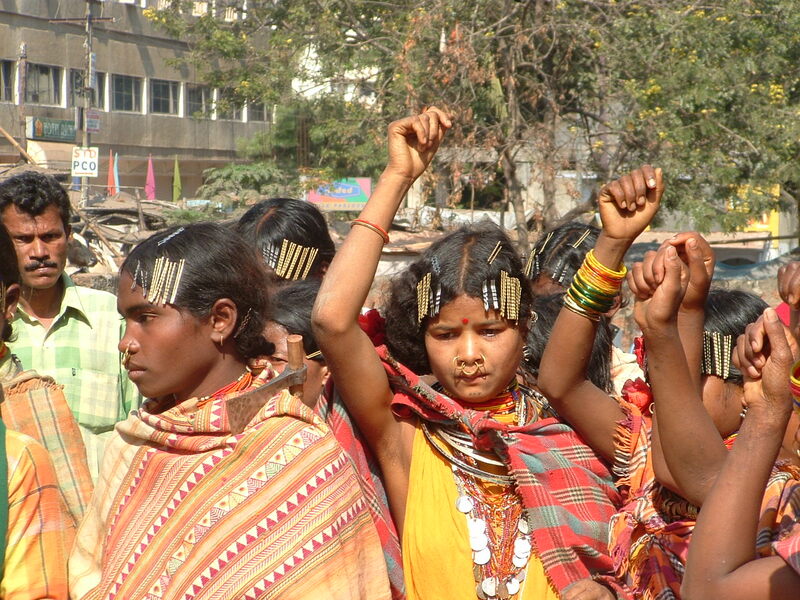 The people were protesting the plans of Vedanta, a British mining company, to start bauxite mining the mountains. Bauxite is the most important raw material for aluminum production and last year the Supreme Court said two of the planned mining projects could go ahead. The protest was the second large-scale demonstration in ten days: on 17 January up to 7,000 protesters marched to the gates of Vedanta’s aluminium refinery in the nearby town of Lanjigarh. 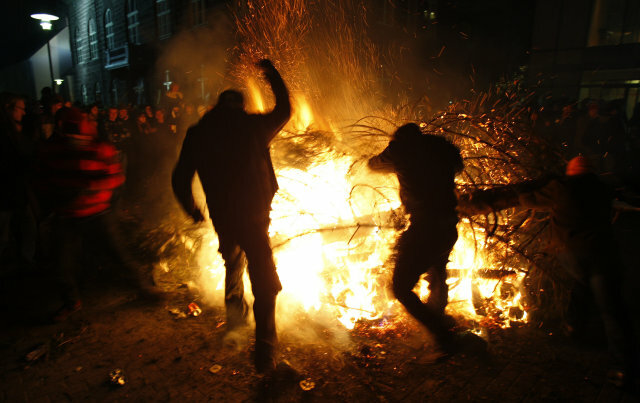 A letter from Icelandic anarchists who have taken part in the revolt against the recently collapsed government. The article originally appeared on Aftaka.org, an Icelandic anarchist website. But what will follow? Have we reached the ultimate goal? Is the minority government of the Left Greens (Vinstri Grænir) and the Social Democratic Alliance (Samfylkingin) enough? Are we just going to settle for new elections this spring? Aftaka.org – Since early this winter, Iceland has been facing economic crisis. The three major business banks have been nationalized, putting their dept on the people’s shoulders. People have been losing their livelong savings, loans have increased and are getting sky high (and for sure they already were high enough). 200 people lost their job, every single day of November and more and more people are facing the threat of losing their houses. Read more on Aftaka.org. 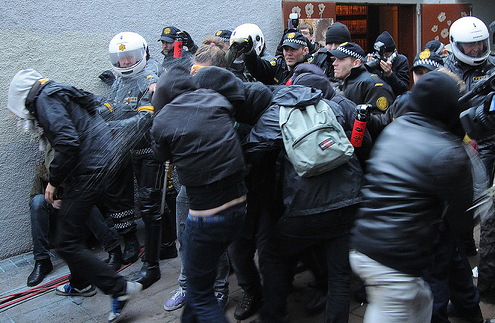 The now regular Saturday protests in front of the Icelandic parliament in Reykjavik went ahead today as planned, but a follow-up demonstration outside the police headquarters ended in the police using pepperspray. During the busy parliament protests, the famous statue of Jonas Sigurdsson was dressed in women’s clothing to remind people of the role of the female half of the population and how they should take a leading role in rebuilding the Icelandic economy. After the rally, some 200 to 300 people took part in a different protest at the main police station to demand the release of Haukur Himarsson, who had been arrested last night when police found out he was the person to fly the Bonus supermarket flag from the top of parliament two weeks ago. After officers in full riot gear used pepper spray to try to disperse the crowds, police eventually released Hilmarsson and the crowd dissipated. It is still not known whether or not the police charged Hilmarsson before his release, however. Hilmarsson was arrested last night after an educational research trip to the Althingi parliament house. He has a suspended 14 days remaining of an 18-day prison sentence he received in 2005 for protests against the Karahnjukar dam. A number of protests have been taking place in Reykjavik, Akureyri and Seydisfjördur where several thousands of people attended and demanded action taken banks and that the prime minister and directors of the central bank would resign. Landsbanki flags were burned at one of the demonstrations on Saturday. Some protestors carried black and green and black and red flags and called slogans such as ‘Burn the banks’. One of India’s most isolated tribes, the Dongria Kondh, is preparing to stop British FTSE 100 company Vedanta from mining aluminium ore on their sacred mountain, after police and hired thugs forced protestors to dismantle a barricade over the weekend.